Jim Woodring og Justin Green har tegnet Aliens! Seriefrämjandets forum » Alternativa serier » Jim Woodring og Justin Green har tegnet Aliens! Tråd: Jim Woodring og Justin Green har tegnet Aliens! 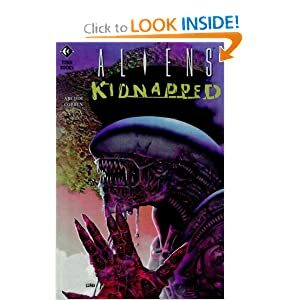 I would like to say that this is one of may favorites in the Aliens graphic novel series. I will not argue with the other reviewers: There is plenty of silliness and grossness, without much fear, action or suspense. What it does offer is a fresh, almost satirical approach to the series. Plus, I found the munching larva to be a distinctly creepy creature. Neither the movies nor the other books have ever dealt much with the first face of the Alien lifecycle.